Great News! This extraordinary condominium has just become available for the Christmas holidays starting Dec. 18, through January 8th!, This is not just a rental but an owner’s home! It is decorated with beautiful, comfortable, and elegant furnishings. For The holidays, it will be decorated for Christmas and will make you feel you are at your home away from home! It is exciting to view the mountains, the sandy beach, the cruise ships passing, whales breeching in season, fishing boats, the para sailers, the pelicans and frigate birds from, all rooms and decks. We have humming birds that like to come drink from our feeders. The elevator opens directly into the house , eliminating steps or stairs for those with handicapped needs and wheel chairs. The showers are walk in, making it convenient for the handicapped. The main deck provides seating for six at a outdoor table as well as a comfortable swing to enjoy the gorgeous view. The beach and pool have Palapas for shaded reading and relaxing. Both bedrooms have full cable TV. The Living Room has a 46" Sony Bravia LCD TV for watching US, local channels as well as sports and movies. The 2nd bedroom has a 50 inch Sony. Both beds are King. There is free Y-fi and Apple TV In the condo. The phone provides free calls to the states! We have an outstanding housekeeper called Carolina that we have had for years. She cleans once a week, changes the sheets, washes the towels and can be trusted. She is available to come another day at your request. Full Furnished Kitchen complete with everything needed to create or serve gourmet meals. Maid Service available available more than once per week at your request. My husband is fom Paducah Kentucky, a graduate of the class of 62 from the Air Force Academy. Otis is a 25 year Vet. In the USAF. His master’s is from Norman OK. In Bisiness Ad, I am from Syracuse New York, attended Plattsburgh University and graduated from Texas Tech U in Lubbock. My under graduate degree is in Home Economics and masters in ED. From UNLV. We have 3 lovely daughters and 12 grandchildren. You should choose this property because it is immaculate, kitchen stocked by a home ex major, is comfortable, is secure, and guaranteed to give you a memorable vacation. We chose This condo because we were impressed with the quality of the construction and the beauty of the location. The staff here at Shangri-La are friendly, helpful and accompanying. Unique benefits include a Vitamix in the kitchen . Also we have an ultra violet system that provides pure drinkable water and ice from the refrigerator and the kitchen sink. Our water pressure is strong providing luxurious showers. Our lighting is romantic and unique and you can see the sunrise from the kitchen counter while you drink your coffee in the morning. Downtown is 3 miles away. Bus service is across the street and taxi’s are always available for a nominal cost. Our beach view is of the Bandares Bay and the surrounding mountains. You will see cruise ships entering and departing Puerto Vallarta as well as our Pirate Ship, the Marigalante. At end of our infinity pool. We have lounge chairs and Palapas available free with restaurant and bar service. We have a beautiful Mountain View from every window in the condo. You can call and receive calls from the states. There are individual air conditioners in each bedroom. Central air is available for additional fees. Parking is available across street on condo premises. Beach towels are provided for the pool. Each bath is provided with lots of towels. Both the master bedroom and the second bedroom have king size beds and their own bathrooms. Large leather sofa & overstuffed recliner chair. Large double door refrigerator w/ice maker & water dispenser. Uses coffee beans or ground coffee and Keurig. Toilet paper, paper towels, spices, condiments are provided. You will enjoy Polish Pottery, and all the utensils a cook could desire. Kitchen is stocked with spices and condiments, pots and pans, Vitamix for making margaritas toaster, toaster oven, Kitchen Aid mixer and much more. You can dine on bar stools in kitchen, dining room table that seats 6 or on deck table which seats 6. In both bedrooms and living room. Bookshelf with wide selection of English books in lobby. Grounds have lawns and Gardens. Both bedrooms have small balconies. Wrap around balcony outside living room and dining room. Deck has swing and dining table that seats 6 with fabulous view of pool and the Bandero bay. There are no steps making it very wheel chair friendly. 2 Hot tubs outdoors next to pool. Our outstanding condo just became available for the Christmas season! It will be decorated festively with Christmas decorations that will rival your own. The condo is not just a rental but truly a home away from Home as it is our home, not just a rental. This is why you will find it spotless, quite lovely and comfortable and much nicer than other rentals. There are absolutely no steps , the showers are walk in so if you are handicapped, or on crutches, it is very convenient. The elevator opens into the condo making wheelchair access . Bus service is available across the street. Also across the street is the Marina where you can walk to dine in many fabulous and fun restaurants. Thursday nights on the Marina, is a exciting place to eat, at specialty restaurants, buy local handicrafts. gifts or dance the night away. There are also, beauty parlors, spas, Massage parlors, stores, coffee shops, tour kiosks, etc. all within a short walking distance! The condo was amazing; it was like being in my own home. The Dinnings were so generous. They included all the paper supplies, kitchen needs, bathroom and toiletries, everything a traveler would need and we didn't have to go out and buy these things. The caretakers for the property - Cosme, Jesse and Carolina - took perfect care to make sure everything worked properly and did terrific cleaning once a week. The condo was furnished for maximum comfort. I can't believe any other condo would match this. Anyone renting will be lucky to have this condo. Thank you so much for the wonderful review Patricia! It is a pleasure to have renters like you to enjoy and take care of our home! Fantastic Location, Floor Plan and Pool/Beach Area! We thoroughly enjoyed our stay in Marina Vallarta. Ann and Otis' Condo is Exceptional and they were fantastic hosts that gave us many great recommendations for restaurants, shopping, activities, etc.! The Condo's Floor Plan is fantastic with large living spaces, many extras in the kitchen and a nice deck with a great view of the Ocean, Grounds and Pool Area, complete with Hummingbird feeders and hummingbirds to provide some entertainment. The pool and beach area are immaculate and probably the best we have ever been to!! Absolutely great views, food and drink service and the option of the beach or pool sitting areas! What a way to unwind in the sunshine of Puerto Vallarta!! The Condo also comes with a driver to and from the Airport and cleaning services every few days which were both very appreciated. The location of the Condo is great as well with many restaurants and shops as well as two good sports bars close by, within easy walking distance! Downtown, the main boat terminal, shopping malls, groceries and the Malecon are all a short inexpensive cab ride away! We would definitely recommend this Condo and will come back again! Thank you so much for the wonderful review! You were caring renters that treated our home as your own. We hope to meet you personally some day. Our family had a wonderful stay at Ann and Otis’s home. Ann had their home fully decorated for Christmas for us to enjoy complete with a Christmas tree. We loved the pool and convenience of the restaurant and pool bar for refreshments and great food. We would definitely recommend to others. We especially enjoyed our coffee watching the hummingbirds drinking from the many feeders on the balcony every morning while lounging on the swing. We were so fortunate to have had Kathy Rutherford and her family. They were wonderful guests and treated our Condo as their own home. It was so nice that they enjoyed our swing, humming birds and even refilled our feeders. 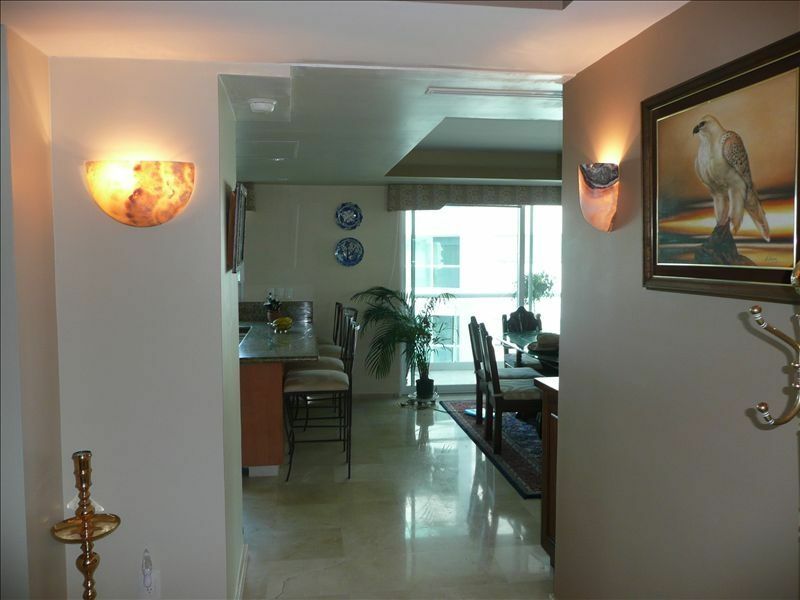 We try to treat our guests as we would love to be treated ourselves and make our condo a very delightful experience.